(instead of 7th Grade level) after comparing the 6th Grade level's Table of Contents to the 7th Grade level's Table of Contents. I also compared the 6th Grade Sample Lesson to the 7th Grade Sample Lesson. Now, my son is in 7th grade, but we've neglected the grammar a bit, and looking at the Table of Contents for Grade 6 vs. the TOC for Grade 7, I decided JD might be over his head in the Grade 7 course. So I requested the 6th Grade set, and I am NOT disappointed. The 6th Grade program costs $40, and includes 2 DVDs with classroom lessons, as well as a CD with the PDF copy of the workbook. From the CD you can print on your own printer, or take it to a business to have it printed. But if you decide you will use the entire workbook, rather than printing the 214 pages at home, I personally recommend you purchase the printed workbook from Essentials in Writing (for only $20) -- much more economical. We started our review period with lessons from the beginning of the course. I was very pleased with the material that my son covered. My own weaknesses also are apparent -- I fail to review his work as often as I should. I read, but I do not see. I forgot to use the Answer Pages at the back of the Workbook to help me check his work. So both of us will be working to improve in the areas of our weaknesses. The assignment below I looked at, and all I saw were the letters that should have been capitalized. Now I see ones capitalized that should not have been, not to mention run-on sentences. I, like my son, am a work in progress. The program has a total of 68 lessons, and each lesson has a number of worksheets with it (often 4-5 per lesson). The program started with basic sentences, explaining subjects and predicates, compound sentences. The program then covers parts of speech: proper nouns, pronouns, verbs (types of verbs: action words, linking verbs, states of being), adjectives, adverbs (see the Table of Contents). The publisher wanted us to also skip ahead in the workbook and try out the writing section, so we skipped to midway through the book. I really enjoyed the way the writing portion of the program then teaches the students techniques to develop their writing skill -- pre-writing techniques, how to write conversations, figurative language (personification, onomatopoeia, hyperbole, etc.). It taught him how to prewrite, draft, revise and polish. The workbook includes teaching how to use graphic organizers. I have to tell you, I am totally impressed with this program. It is so well laid out that in two short weeks my son went from a condition of needing me to spoon feed him his lessons (setting up the DVD, playing the lesson, telling him what lesson to do) to a place where he was able to take do the course by himself! For the 3rd and 4th week of the review, each day he was able to tackle the work unassisted! I certainly wish I had started this last year, and that I had been able to cover the Grade 7 material this year! But at least we did start it now, and I am so glad! It is a very good program. For the first time in years, when I go to get my end-of-year home school review, I am going to feel good about what JD accomplished this year in writing and grammar! With the time of this review coming to a close, I can guarantee you that I will be continuing with this program. There are sections we have not done yet that I do not want my son to miss. I look forward to a day when I can inform him that the writing assignment of the week is a compare/contrast essay, and he will take the assignment willingly and complete it well. We're not there yet... I feel a long way from it... But I can see that there is hope. This program has given me that hope. 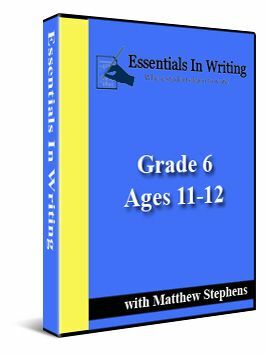 Essentials in Writing has a program for every grade from 1st through 12th. (And it is perfectly okay to use the level that you think best fits your child, even if it is not their actual "grade".) The product is DVDs and PDFs, which means that if you can use this product over and over again with each of your children. I love this product and I HIGHLY RECOMMEND IT! Go check out their website. They have lots of links for Tables of Content, sample lessons in PDF format, and sample lessons videos. Let me know what you think. To read more Schoolhouse Crew Reviews of Essentials in Writing click the link below. Thanks for reading. This is an old post, but very timely for me as I try and decide if my son (who will be going into 7th grade next year) should start with Level 6 of this program or Level 7. I feel pretty confident after this review and comparing the Tables of Content between the two levels, that Level 6 would be what he needs! Thanks! Thank you for your comment! I'm glad you found my review helpful.